In this case Drassanes Dalmau has designed and built an innovate catamaran of 180 passengers, 24m. length and 10m. 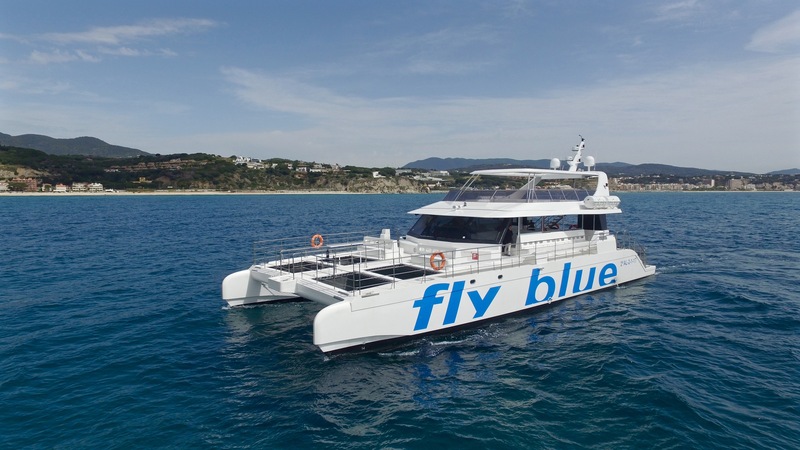 beam, following the same philosophy of Fly Blue Tres, but in this occasion improving more in the passengers comfort, achieving the passengers to feel the sensation of navigate in their own yacht, for that reason Drassanes Dalmau outfits the boat with wide spaces like the Fly bridge on the top with a sunroof, the big solarium in bow with retractable bath ladder, totally integrated below the deck, and a wide saloon of passengers with lateral locks that enable the boat to work during winter season, maintaining an excellent exterior vision; Drassanes Dalmau improves on it using innovative sliding windows hidden into the passengers seats. Also, in this occasion, Drassanes Dalmau has designed two wide bath platforms for the practice of nautical sports. Drassanes Dalmau has managed to reduce still more the displacement of the boat optimizing the comfort and the stability in conditions of surge.